The Acting Chairman of the Economic and Financial Crimes Commission (EFCC), Ibrahim Magu, has said that his agency would increase the tempo in the fight against corruption in the country this year, urging the media to support the crusade. Magu disclosed this yesterday at the premises of the Lagos High Court after visiting the state's Chief Judge, Justice Opeyemi Oke. He added: " Everybody has a responsibility in this fight and we are here to mobilise you also. It has been a tough one and we are going to increase the tempo in the fight against corruption this year. This time, we are fighting hard like never before.
" I want to thank you all for supporting what we are doing and urge you to continue the good work." The EFCC boss further stated that he appreciates the role of the judiciary. He continued:" If you notice, the new Chief Judge of Lagos State and the Chief Judge Nigeria (CJN), Justice Walter Onnogen, are really hardworking people and have put in many efforts with the help of other judges. "We cannot fight corruption alone and we need the individual effort of every journalist. The judicial correspondents also. Journalists must join us and desist from collecting brown envelopes." Meanwhile, Nigerians have rated the anti-graft war of the President Muhammadu Buhari administration, scoring it slightly above average. According t o a survey conducted by CLEEN Foundation, Practical Sampling International and Afrobarometer, public perception improved dramatically since 2015. In the report released yesterday in Abuja, about 59 per cent of Nigerians rated the crusade slightly above average. 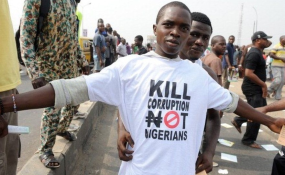 According to the study, six in 10 Nigerians believe that the government was performing fairly in anti-graft war. The report noted that more than 90 per cent of the citizens still believe that public officials are corrupt and majority of them fear victimisation if they report corrupt acts to constituted authorities. Despite efforts by the administration, the report finds out that majority of Nigerians still believe that ordinary people will make difference in the fight if they are co-opted. Speaking on how to increase the efficiency of the fight against graft, Country Director, Plan International, Dr. Hussaini Abdu, said government must take decisive action when corruption cases arise.